Rachel has turned herself into a regular Soup Diva. Here’s the first in a series of articles about how to make some easy, healthy and nutrilicious soups. Take it away, Rachel. In our Top 10 Lifestyle Changes list, we recommend adding beans and lentils (aka pulses to your diet. They are high in protein and fiber, while being low in fat. One of the primary ways we like to include legumes in our diet is in soups. Below are five lentil soup recipes. I didn’t even like lentils when we began all this healthy lifestyle stuff, back in October, but I’ve found many different varieties and recipes and have grown to love them. In Part II, I’ll share some ideas for using other legumes and grains in soups. Soup’s on! Click on the “Read the rest of this entry” link below for more. Green lentils mostly stay whole, but are quite soft when cooked. You can serve the soup as is or puree it. Cut the vegetables into medium dice. Heat a heavy bottomed 4 quart or larger soup pot, add 1 tsp oil. Add vegetables to pot and sweat for 5 minutes. While the vegetables are cooking, examine the lentils for bad ones or small pebbles, then rinse in a colander. Add to pot along with water, salt, bay leaves and herb sprigs (if you don’t have fresh herbs, use a tsp each of a variety of dried herbs). Bring to a boil, then reduce heat and simmer for 30 minutes. Taste the lentils for tenderness, it may need to cook an additional 10-15 minutes or may already be done. Remove the herb sprigs. For a smoother soup, puree it in small batches in a blender. Serve immediately, or freeze in individual portions. Makes about 10 portions. Du Puys lentils are small speckled greenish brown lentils. They retain their shape when cooked. Don’t use these more expensive lentils if you want a pureed soup. The original recipe called for sorrel, I substitute spinach and lemon. Cut the vegetables into small dice. Heat a heavy bottomed 4 quart or larger soup pot, add 1 tsp oil. Add vegetables to pot and sweat for 5 minutes. While the vegetables are cooking, examine the lentils for bad ones or small pebbles, then rinse in a colander. Add to pot along with water, salt, bay leaves and thyme. Bring to a boil, then reduce heat and simmer for 30 minutes. Taste the lentils for tenderness, it may need to cook an additional 10-15 minutes or may already be done. Remove the herb sprigs. Stir in the fresh spinach and simmer for about 5 minutes. If serving immediately, stir in the fresh lemon juice and serve with a wedge of lemon on the side. If freezing portions for later, use apple cider or other mild vinegar as the lemon flavor is not as strong after freezing. Garnish with black pepper when serving. Makes about 10 portions. Whole red lentils stay whole. Don’t puree this soup, having the lentils whole is part of the texture. The finished soup is brown rather than the red of the split lentil soup. I could only find whole red lentils at a small Mediterranean grocery, labeled as Crimson Lentils, but they weren’t expensive. They look like small brown lentils, but you’ll see a few small specks of pink (just like split red lentils) where a few have broken. Cut the vegetables into small dice. Heat a heavy bottomed 4 quart or larger soup pot, add 1 tsp oil. Add vegetables to pot and sweat for 5 minutes. While the vegetables are cooking, examine the lentils for bad ones or small pebbles, then rinse in a colander. Add to pot along with water, salt, bay leaves and herb sprigs (if you don’t have fresh herbs, use a tsp each of a variety of dried herbs). Bring to a boil, then reduce heat and simmer for 30 minutes. Taste the lentils for tenderness, it may need to cook an additional 10-15 minutes or may already be done. Remove the herb sprigs. Serve immediately, or freeze in individual portions. Makes about 10 portions. Split red lentils break down almost completely when cooked, so it is only necessary to puree in a blender if you want to fully incorporate the vegetables to make a more velvety soup. Cut the vegetables into small dice. Heat a heavy bottomed 4 quart or larger soup pot, add 1 tsp oil. Add vegetables to pot and sweat for 5 minutes. Rinse the lentils and add to pot along with water, salt, bay leaves and herb sprigs (if you don’t have fresh herbs, use a tsp each of a variety of dried herbs). Bring to a boil, then reduce heat and simmer for 15 minutes. Taste the lentils for tenderness, it may need to cook an additional 5-10 minutes or may already be done. Remove the herbs and, if you desire, puree the soup in a blender. Do it in small batches and be careful of splatters. Stir in the fresh parsley. Serve immediately or freeze in individual portions. Makes about 8 portions. This soup is a little sweet and a little sour. A delicious and unusual way to serve lentils. I originally found it here. Here’s my version, with just a few modifications. Wipe your kitchen shears or knife with a bit of oil before chopping dried apricots. Heat the oil in a large soup pot. Add the onion, garlic, dried apricots, cumin, and thyme. Sweat for about 10 minutes. Add the lentils, 2 strips of lemon peel, stock and water; bring to a boil. Simmer until the lentils are tender, 20 to 30 minutes. Remove the lemon peel. Stir in the tomato, and simmer for another 10 minutes. Puree half of the soup in a blender or food processor and return it to the pot. Add lemon juice, mint, salt and pepper to taste. Makes approximately 6 servings. Adapted from the Red Lentil Soup recipe in The Vegetarian Times Complete Cookbook. I changed the technique a little and left out the coconut milk and I use less oil, making the curry flavor more pronounced. You can use whole or split red lentils for this soup. I use a mixture. Heat oil in a heavy soup pot. Add onions and saute until they begin to brown, about 10 minutes. Add carrots, garlic and ginger and cook for a few more minutes. Then add the lentils, water, bay leaf and curry powder. Bring to a boil and simmer for 20 minutes, if only using split red lentils, or 30-40 minutes if using whole red lentils. Taste for seasoning and add salt. Puree the soup in batches in a blender, or using a stick immersion blender. Stir in cilantro just before service. This entry was posted on Sunday, March 16th, 2008 at 11:20 am and is filed under Food, General, Healthy Eating, Recipe. You can follow any responses to this entry through the RSS 2.0 feed. You can leave a response, or trackback from your own site. These soups are wonderful, I have made variations of some of them this winter using my crock pot. Basically you throw all the ingredients in the crock pot in the morning, set to low, and come home to wonderful smells and a great dinner. While most of these soups use water, I am curious what you are doing about your stocks (chicken, beef, vegtable) considering your life style changes. Are you making your own stocks, buying premade, or other? What brands (of packaged stocks) have you found you like the most? A lot of the soups we’re making now are vegetarian or even vegan. However, I still make my own stock. I generally save up turkey and chicken carcasses (although I’m making fewer whole chickens now, Jason loves fresh roasted turkey breast and if you buy a turkey breast in the store, it comes with most of the carcass), and buy chicken legs and wings for more flavor and collagen. I chill and defat stocks before freezing in quart or pint containers, and I don’t add salt until it’s used a recipe. Hint: add a pinch of salt to a cup and pour a little of the hot stock in it to taste – you don’t get the true flavor without a little salt. I recently bought some Pacific brand organic chicken broth at Costco, also spotted at Whole Foods, which is pretty good. Although it is a little salty. So, when we use it as the base for a Chinese stir fry sauce, we cut back on the soy sauce. But I don’t used canned stocks or broths as the basis for soup. However, even for my vegetable based soups, I still like a little of that special something (salt, msg, chemicals?) found in dry bouillon. That’s why I’ll occasionally add a cube of Star brand chicken or porcini mushroom bouillon, usually replacing the salt. The Armenian Red sounds great! Then again, anything with cumin… :-) It looks like I might have a child home sick tomorrow, so perhaps I’ll try this then. Thanks! 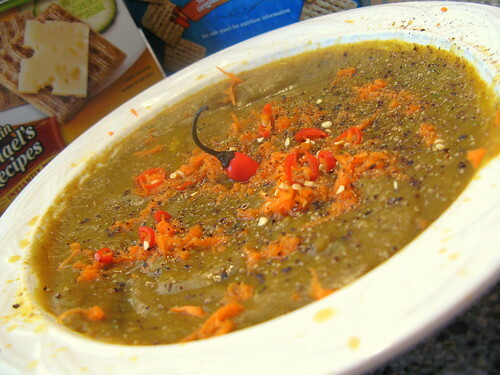 For a sick child, I’d go with something blander, like the basic split red lentil soup, pureed. But make a pot of the Armenian one for yourself — since your’e stuck home and all. Can you please tell me what you cook for Hag Hamatzot? We are vegan and would like some ideas from you? Some of these sound great! Here’s my favorite lentil soup (though it doesn’t have a ton of lentil.. I think it’s from a well known spa or low fat cookbook. It’s delicious. I usually use oil instead of margarine, sometimes omit the rice or use a different grain, and skip the corn occasionally. Place lentils in a bowl and cover with water. In a large pot, saute garlic, celery, and onion in margarine until tender. Stir in carrot and potatoes. 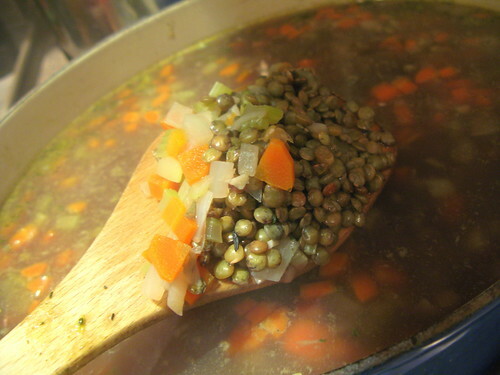 Drain water from lentils and add lentils to vegetables. Add water, tomato juice, salt, thyme and brown rice. Bring to a boil. Reduce heat, cover and simmer until letnils and potatoes are tender. Add corn and soy sauce and cook 10-20 minutes more. Makes 10 one cup servings. I give healthy cooking classes here in my kitchen in Upper Saddle River. You might be interested in some of my tricks to eating very well. I make similar lentil soups but with many more layers of flavor…..
ps – The red lentil curry soup recipe doesn’t have the amount of water listed. Thanks Will, I fixed it. Lentil Soup is one of my very favorite foods. My mother prepared it every New Year’s as our insurance for good luck in the coming year. For Italians, the coin-shaped lentils are supposed to promote prosperity. I continue this tradition, sometimes using the orange lentils but the brown are definitely the sentimental favorite. These recipes will add great dimension to my lentil repertoire!